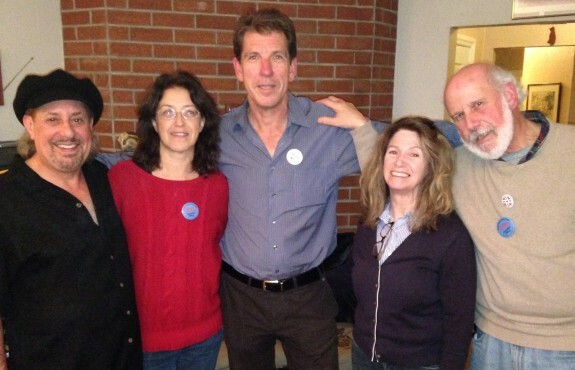 Unity Slate candidates Steve Stallone, Gloria La Riva, Carl Hall, Rebecca Rosen Lum and Richard Knee. Not pictured are Derrick DePledge and Michelle Caplette. Local election officers have issued a tentative certification of results declaring Executive Officer Carl Hall and the “Unity Slate” were the clear victors over the all-interpreter “A More Perfect Union Slate” for leadership of the Pacific Media Workers Guild. Results showed Hall won with 614 votes out of 1,024 valid ballots cast. Others on the Unity Slate won with similar margins, including Rebecca Rosen Lum as president, Gloria La Riva as first vice-president, Michelle Caplette as treasurer and Steve Stallone as secretary. Three vice presidents ran without opposition: Ariel Torrone representing CFI members, Derrick DePledge representing Hawaii, and Richard Knee representing California. Terms are for two years beginning January 1. Hall has been traveling during the Guild’s annual office closure for the holidays, but sent a Christmas Eve message from Morocco calling on all members to renew their commitment to solidarity. “It’s time to move past the election and begin the real work of building a united, strong local,” Hall said, noting that a General Membership Meeting has been set for February 8. Alex Abella, who headed the CFI slate, announced on Christmas Eve that he intends to challenge the election results on various grounds. Hall and his allies “stole the election,” Abella wrote in an email sent to some members.